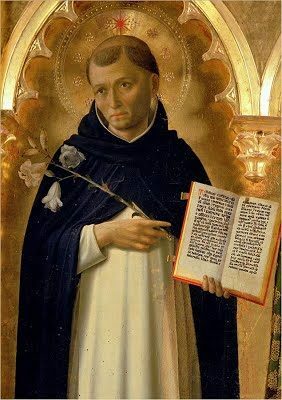 August 8 - Saint Dominic, Priest - Memorial - My Catholic Life! Today’s saint and Saint Francis of Assisi were close contemporaries. They both founded influential religious orders, collaborated with the same popes and cardinals, and were canonized soon after their deaths. Francis is a rich, technicolor, three-dimensional figure even many centuries after his death. Dominic is not. His personality is obscure. Francis jumps off the page. Dominic is found between the lines. No cult of personality developed around Dominic as it did around Francis. Yet whereas Francis was unsuited to leadership and perplexed by organizational necessities, Dominic quietly excelled in every area. Because of his skills, his well-structured order had none of the grave problems that almost doomed Franciscanism. Dominic’s personality retreats behind the hum and whistle of the order that embodied his vision. Dominic, born in Spain, spent many years dedicated to his university studies before accompanying a local bishop on a royal errand that took them across Europe, including through Southern France. In the city of Toulouse, France, Dominic had his first encounter with the Cathars, a heretical sect of rigorist purists on the margins of Christianity. Dominic would spend the better part of ten years of his short life strategically contemplating and implementing a pastoral plan to bring the Cathars back into the fold of Mother Church. Dominic concluded very early on in this missionary endeavor that the witness of priests had to be more authentic for them to be effective among the Cathars. No more traveling by horse. No more nice meals. No more inns. No more beds. No more shoes. The priests who went to the Cathars must beg like the Cathar holy men. They must walk, not ride, like the Cathar holy men. They must go barefoot, fast, pray, be humble, wear simple clothes, and live strict chastity and celibacy like the Cathar holy men. Then, and only then, would the Cathars listen to the priests. The Cathars listened to Dominic. He had been practicing these things rigorously and joyfully for many years. He was the icon of an authentic priest. Dominic, in short, had credibility, and his learning was self-evident in his preaching. Dominic’s pastoral efforts, in the end, had to cede to the religious violence so common to the time. Church and state authorities ran out of patience, and the Cathars were ruthlessly crushed. His many years of heading a band of educated preachers amidst a difficult pastoral situation equipped Dominic for leadership and gave him a strong sense of how sound theology impacted pastoral practice. Loving God was not like going on a blind date. The Church provided the faithful with the tools to know God, not just know about Him. The Church gave the faithful the means to love God, not just talk vaguely about loving Him. Dominic knew the truth and how to present it, by word and example, effectively. By 1215 he had received papal permission to lead his own group of preachers. That same year, he attended the Fourth Lateran Council in Rome to solidify his canonical position. From 1215 until his death, Dominic traveled, organized, recruited, and planned. He was driving the foundations of his order deep into theological and canonical bedrock. Amidst this tornado of activity, he lived perfect poverty, chastity, obedience, humility, and charity. He was known to often say “Whoever governs the passions is master of the world. We must either rule them, or be ruled by them. It is better to be the hammer than the anvil.” He shared the fruits of his contemplation in every conversation and encouraged his brothers to do the same. His poverty was such that when he died in Bologna, in his early fifties, he lay in someone else’s bed, because he didn’t have one of his own, wearing another’s habit, because his own had fallen to pieces. The Dominican order exploded with growth during his lifetime. It is still today one of the Church’s preeminent, and truly global, orders dedicated to scholarship, preaching, education, publishing, and evangelization. If causes are known by their effects, Saint Dominic was a relentless, one man, army for God. Saint Dominic, your dedication to the truths of the Catholic faith gives beautiful witness to the faithful. Help us to emulate your poverty, charity, and chastity in our daily lives, and to strive to obtain your erudition and verve in evangelizing others in our words and deeds. ST. DOMINIC was born in Spain, in 1170. As a student, he sold his books to feed the poor in a famine, and offered himself in ransom for a slave. At the age of twenty-five he became superior of the Canons Regular of Osma, and accompanied his Bishop to France. There his heart was well-nigh broken by the ravages of the Albigenian heresy, and his life was henceforth devoted to the conversion of heretics and the defence of the Faith. For this end he established his threefold religious Order. The convent for nuns was founded first, to rescue young girls from heresy and crime. Then a company of apostolic men gathered around him, and became the Order of Friar Preachers. Lastly came the Tertiaries, persons of both sexes living in the world. God blessed the new Order, and France, Italy, Spain, and England welcomed the Preaching Friars. Our Lady took them under her special protection, and whispered to St. Dominic as he preached. It was in 1208, while St. Dominic knelt in the little chapel of Notre Dame de la Prouille, and implored the great Mother of God to save the Church, that Our Lady appeared to him, gave him the Rosary, and bade him go forth and preach. Beads in hand, he revived the courage of the Catholic troops, led them to victory against overwhelming numbers, and finally crushed the heresy. His nights were spent in prayer; and, though pure as a virgin, thrice before morning broke he scourged himself to blood. His words rescued countless souls, and three times raised the dead to life. At length, on August 6, 1221, at the age of fifty-one, he gave up his soul to God. Reflection.—”God has never,” said St. Dominic, “refused me what I have asked;” and he has left us the Rosary, that we may learn, with Mary’s help, to pray easily and simply in the same holy trust.